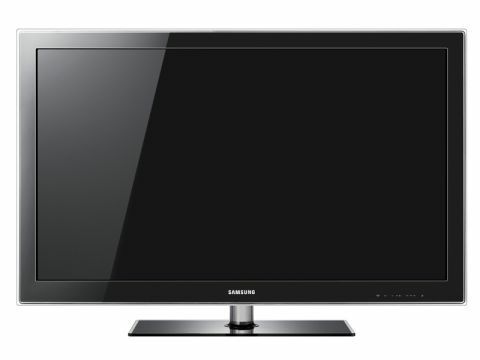 Despite not having the same ultra-slim looks of Samsung's iconic B7000 and B8000 LED models, the LE40B550 LCD TV is still very easy on the eye with its subtle curves, 'crystal' finish and transparent outer border. Its array of connections is gratifying too, as it joins the Toshiba contender in offering four HDMIs, as well as a USB port for playback of MP3s and JPEGs. There's no sign of the Ethernet port found on Samsung's higher spec flat TVs, though, so you can't jack into a DLNA-certified PC or Samsung's online service. But this is fair enough for £580. Slightly more concerning is the lack of any 100Hz processing. But the TV does sport the maker's multifaceted Digital Natural Image engine, an edge enhancement mode, and various tricks for boosting black levels and colour gamut while reducing noise. While not achieving the giddy picture quality heights of Samsung's LED and B650 LCDs, the 40B550 certainly delivers way better pictures than you'd expect for the modest price tag. For instance, the 40B550's dark picture elements look credibly toned and full of shadow detail. There's a touch more grey around than you get with the company's higher-spec models, but that doesn't stop the TV producing the most natural black levels. The set also excels with colours, which are exceptionally vibrant, richly saturated, subtly blended and exceptionally natural in tone. HD images on the 40B550, meanwhile, look immaculately sharp and full of texture and detail. And it's also rather good with SD – provided, at least, that you choose the new Natural picture preset, then tweak it by reducing the contrast and deactivating the noise-inducing Edge Enhancement feature. Actually, all the 40B550's picture presets need a little work to stop pictures looking over-aggressive and noisy. But aside from this, the only other issues with its pictures are that (like most LCD TVs) they lose contrast if watched from a wide angle and suffer minor motion blur. Having 100Hz processing might have fixed this latter issue, but we suspect some prospective buyers will like the fact that there isn't any, since such systems can generate unwanted side effects. The 40B550's only truly weak link, in fact, is its sound. Daytime TV fare is acceptable, but action movie scenes reveal a disappointing lack of raw power and dynamic range, leaving them sounding thin and unengaging.